The Dark Tower series is the backbone of Stephen King's legendary career. Eight books and more than three thousand pages make up this bestselling fantasy epic. 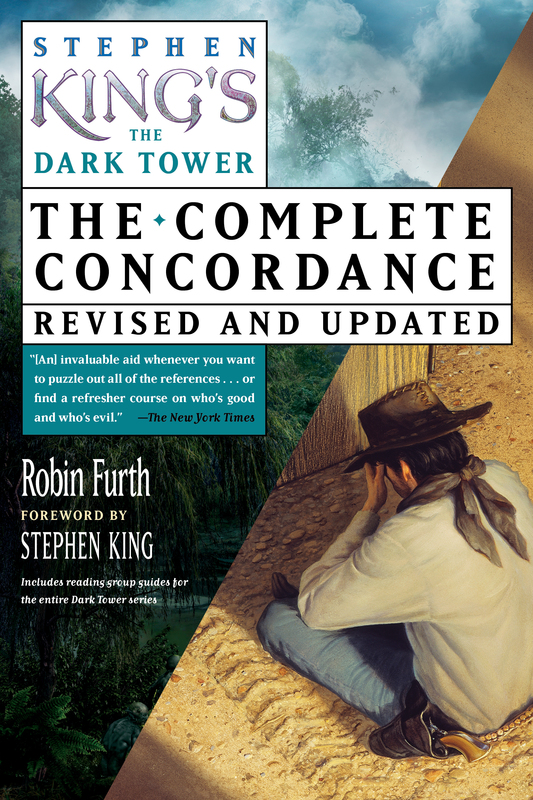 The Complete Concordance is an entertaining and incredibly useful guide to Stephen King’s epic Dark Tower series, covering books I-VII and The Wind Through the Keyhole, and is the definitive encyclopedic reference book that provides readers with everything they need to navigate their way through the series. With hundreds of characters, Mid-World geography, High Speech lexicon, and extensive cross-references, this comprehensive handbook is essential for any Dark Tower fan. Enter Robin Furth. She came to me courtesy of my old friend and teacher at the University of Maine, Burton Hatlen. Burt is a wonderful scholar of poetry and popular fiction. He has written about Roland for several scholarly journals, and was sympathetic to what I was up to with the books (indeed, he seemed to understand what I was up to better than I did myself). So I gave him my list of requirements with some confidence (some hope, at least) that he would find the right person. Someone who was bright and imaginative. Someone who had read a good deal of fantasy (although not necessarily the Tower books themselves), and was therefore familiar with its rather unique language and thematic concerns. Someone who could write with clarity and verve. Someone who was willing to work hard and answer arcane and often bizarre questions (Who was the mayor of New York in 1967? Do worms have teeth?) on short notice. He found Robin Furth, and my wandering gunslinger had found his Boswell. The concordance you hold in your hands—and which will surely delight you as it has delighted me—was never written to be published. As a writer I like to fly by the seat of my pants, working without an outline and usually without notes. When I have to slow down to look for something—a name in Volume III, say, or a sequence of events way back in Volume I—I can almost feel the story growing cold, the edge of my enthusiasm growing blunt and flecking out with little blooms of rust. The idea of the concordance was to limit these aggravating pauses by putting Roland’s world at my fingertips—not just names and places, but slang terms, dialects, relationships, even whole chronologies. Robin provided exactly what I needed, and more. One day I walked into my office to discover her down on her knees, carefully sticking photographs to a huge piece of poster paper. It was, she explained, a “walking tour” of Second Avenue in New York, covering the avenue itself and all the cross streets from Fortieth to Sixty-sixth. There was the U.N. Plaza Hotel (which has changed its name twice since I started writing Roland’s story); there was Hammarskjöld Plaza (which did not even exist back in 1970); there was the spot where Tom and Jerry’s Artistic Deli (“Party Platters Our Specialty”) once stood. That poster eventually went up on the wall of my writing room in Florida, and was of invaluable help in writing Song of Susannah (The Dark Tower VI). In addition to the “walking tour” itself, Robin had patiently winkled out the history of the key two blocks, including the real shops and buildings I’d replaced with such fictional bits of real estate as Chew Chew Mama’s and The Manhattan Restaurant of the Mind. And it was Robin who discovered that, across the street from 2 Hammarskjöld Plaza, there really is a little pocket park (it’s called a “peace garden”) that does indeed contain a bronze turtle sculpture. Talk about life imitating art! As I say, her concordance was never meant to be published; it was created solely as a writer’s tool. But, even with most of my mind preoccupied by the writing of my tale, I was aware of how good it was, how interesting and readable it was. I also became aware, as time passed and the actual publication of the final three volumes grew closer, of how valuable it might be to the Constant Reader who’d read the first three or four volumes of the series, but some years ago. In any case, it was Robin Furth who inventoried the goods I had on sale, and replaced all the dim overhead lights so I could see everything clearly and find my way from Housewares to Appliances without getting lost . . . or from Gilead to Calla Bryn Sturgis, if you prefer. That in no way makes her responsible for my errors—of which I’m sure there are many—but it is important that she receive credit for all the good work she has done on my behalf. I found this overview of In-World, Mid-World, and End-World both entertaining and invaluable. So, I am convinced, will you. Spoiler’s Warning: This Concordance keeps no secrets. Read it only after you have finished all seven of the Dark Tower books. For those of us who have traveled with Roland Deschain from the wastes of the Mohaine Desert to the Castle of the Crimson King and then beyond, to the farthest reaches of End-World, the journey has been a long one, say thankya. For many Constant Readers, it has taken more than twenty years; for sai King, the travels have spanned more than thirty. And for Roland, who is able to leap over whole generations in pursuit of his quarry and his quest, the pilgrimage has lasted more than three hundred.8 Yet as Eddie Dean points out at the beginning of Wolves of the Calla, time is elastic. Despite what we’ve been told about the accuracy of clocks, no two sixty-second periods are ever identical. Although a minute may move like dried mud while we’re waiting or when we’re bored, it speeds to the point of invisibility when we’re in the throes of change. And what is a novel but a tale of transformation and discovery? Over the course of the Dark Tower series, we witness tremendous transformation, both in our characters’ natures and in the parameters of their quest. What began, in The Gunslinger, as the story of one man’s obsessive pursuit of a goal becomes, in the final three books of our story, a tale of personal, and universal, redemption. By the time we reach the final page of our saga, we have witnessed so much. Roland, once a lone traveler willing to sacrifice anything and anyone to the achievement of his end, has drawn three companions to him9 and has trained them to be gunslingers. With his new tet-mates, Roland discovers the Bear-Turtle Beam and follows it to the haunted regions of End-World, where the Dark Tower sits. Along the Path of the Beam, the bonds of khef, which unite his new ka-tet, are tested and proved strong. And Roland, always an emotionally reticent man, rediscovers his ability to trust and to love. With this newfound knowledge, he can finally admit, and repent, all of his previous betrayals. In many ways, the Dark Tower series falls into two parts: the adventures that Roland and his companions have in Mid-World (all of which were written before Stephen King’s accident in 1999) and those that take place in the borderlands and End-World, which were penned after our author began to recover from the accident that almost claimed his life. The adventures our ka-mates have in both halves of their tale are dramatic, but the nature of the changes they undergo as a result are quite different. In the first four Tower books, the transformations our tet experiences are, in large part, personal. As well as bonding as a group, united in their vision of one day reaching the Dark Tower, each member has to battle his or her own demons. Eddie overcomes heroin addiction. Susannah’s dual personalities of Detta and Odetta merge into a unified whole. Jake abandons his lonely life in New York to join his adopted father’s quest, and Roland, who up until this point has been a self-obsessed loner, learns to value his tet as highly as he values his search for the linchpin of existence.10 Yet if the first four Dark Tower books are about the khef11 that binds self to ka-tet, in the final three novels, the responsibilities of khef ripple outward, encompassing not just the debt the individual owes to his tet-mates but the responsibilities each of us has to the greater world—or, in the case of the Dark Tower series, to the multiple worlds. By accomplishing these tasks, our tet remains true to the Way of Eld, which demands that gunslingers protect the weak and vulnerable from those who would oppress or exploit them. Yet in defending the White against the ever-encroaching tide of the Outer Dark, our tet (like our author) comes under the shadow of ka-shume, the shadow of death.14 In The Dark Tower, Roland and his friends destroy the Devar-Toi, or Breaker prison, and free the Breakers.15 They halt the erosion of the Beams (which we are assured will regenerate), but Eddie Dean pays for this victory with his life. Not long after, when Roland and Jake travel to the year 1999 so that they can save their maker, Stephen King, from his predetermined collision with a Dodge minivan, Jake Chambers heaves his last breath. It seems that ka demands a life for a life, and though Stephen King survives his terrible accident, Jake does not. And it is here, on Slab City Hill in Lovell, Maine, by the prostrate and profoundly injured body of our kas-ka Gan, and by the side of our gunslinger Roland, who grieves over the corpse of his adopted son, that I would like to pause. It is not a comfortable place to be—either for sai King, who lies bleeding in a ditch, or for us, who are unable to help—but it is an important place. Like Detta Walker’s Drawers, this little patch of road in the year 1999 (when the ka of our world and the ka of Roland’s world are united) is a place of power. It is a doorway between the rational and irrational worlds, a place where the veil is at its thinnest. And it is in this place where life and death meet that Roland accomplishes something worth discussing. By sacrificing what he loves above all else in order to save the life of the man who created his universe—a man who must live if the story of the Dark Tower is to exist in any world—Roland does what we assume is impossible. He stops the wheel of ka and alters its path. Throughout the final three books of the Dark Tower series, we are told that, in the Keystone World we inhabit, there are no do-overs. Once an event has taken place, it cannot be changed. Yet it seems that this “truth” is not necessarily true. At the end of Song of Susannah, we are given Stephen King’s obituary—ostensibly taken from the Portland Sunday Telegram—which states that King died at 6:02 PM on Saturday, June 20, 1999, at Northern Cumberland Memorial Hospital in Bridgton, Maine. Yet Stephen King didn’t die. As we all know, he survived (albeit with terrible injuries) and returned to his computer keyboard to finish the last three books of his Dark Tower saga. On one level of the Tower, King’s life was saved by paramedics and doctors, and that most fickle of mistresses, Lady Luck. But on another level, the one that we all inhabit when our rational minds switch off and our imaginations wake up, Stephen King was saved by his characters. When I was nineteen, I read a play by the Italian playwright Luigi Pirandello. The play was called Six Characters in Search of an Author. In it, six characters—all of whom have been abandoned by their original creator—go in search of a new person to pen their story. The person they turn to is a theater manager, already in the process of staging a different play. At first, the theater manager thinks these characters are either mad or joking, but as their traumatic story begins to unfold, he finds himself drawn into it. But no matter how the new playwright (for that is what he becomes) tries to bend the plot or alter the characters’ temperaments, he can’t. You see, the story already exists, from beginning to end, and the characters who live within its unwritten pages stubbornly hold on to their unique identities. What they want, and what they demand, is a writer who is willing to stand and be true—a person able to facilitate their tale and give it life, tragic as that tale turns out to be. A number of years ago, in a writers’ magazine, I read a firsthand account of an author’s experience creating a character, and that, too, has remained with me. The author of the article (who was writing for an audience of apprentice authors) told of her experience with a character she called Bird. And though I lost the article long ago (which, like so many things in my life, I put in a place that at the time I had deemed “safe”), I still remember Bird. You see, Bird saved his author’s life. What felt like hours later, the writer was roused by Bird shaking her. Groggily, she opened her eyes and there was her character, standing by the bed. Bird put his hands by his throat. “I can’t breathe!” he said. And then suddenly, the author realized what had happened. The old cottage was much less drafty than it had originally seemed, and the fire had eaten almost all of the oxygen. She and her husband, unconscious beside her, were asphyxiating. Almost unable to move, the writer rolled onto the floor, crawled to the door, and managed to push it open. Fresh winter air wafted into the room, and both she and her husband survived. But only because of Bird. The explanation this author gave for her paranormal experience was this: She hadn’t finished telling Bird’s story yet, and Bird couldn’t survive without the umbilical cord of thought which connected them. In order to live, Bird needed her to live, and Bird was determined to exist in the world. Self-serving heroism? Perhaps. But does that lessen the act’s importance? Definitely not. Especially as far as the author was concerned. I once read an article about the early-twentieth-century French explorer Alexandra David-Neel. Evidently, while she studied with monks in Tibet, she learned how to create thought-forms by focused concentration. These thought-forms, which spring from the imagination of the creator, eventually gain an independent existence and can even (if they are especially powerful) become visible to other people. For me, characters are a kind of thought-form. An author creates them (or facilitates their passage into our world), but then the characters exist in the minds of many. They can live well beyond the lifespan of their creators; they can even exist independently of the book or story they originally inhabited. Think of Hamlet or Heathcliff or Dracula. Or of Roland Deschain. There are some Dark Tower fans out there (including some very close to my heart) who like it when Stephen King appears in his films, but who are not comfortable with him entering his fiction. The reason? When King enters his own stories and his characters are shown to be just characters, it breaks the spell. When you think about it, such a reaction—even among devoted Tower junkies—isn’t so surprising. Given the world we are expected to live in, where fact is supposed to be fact and fiction is supposed to be fiction, the two of them as separate as our waking lives and our dreaming lives, the events that take place in the final two books of the Dark Tower cycle are bound to confound us. The traditional suspension of disbelief, which we put on like a thinking cap whenever we sit down to read a fantasy adventure of any kind, isn’t enough anymore. We have to allow the magic of that world—the world of the book—into our world, where we must earn a living, pay rent, eat, argue, and worry. In other words, those barriers we erect for our self-protection—barriers which separate our imaginative lives from our mundane ones—begin to break down. And if we’re not careful, the guardrails of the rationalist, no-nonsense universe begin to snake out of control. And if those rails disappear, then we can free-fall into todash space, that no-place between worlds where monsters lurk. As normal, functioning adults, we can’t believe in surreal experiences any more than we can maintain that clapping our hands will bring Tinkerbell back to life. After all, we left all that behind in grade school. Or did we? For me, the scenes where Stephen King’s characters enter his life, and change it, are very powerful. They are powerful because they express the secret relationship King has with his creations. As every writer knows, writing is a two-way street. We may give birth to our characters, but our characters also change us. When Steve King writes about Eddie and Roland visiting him in Bridgton and then, many years later, Roland and Jake coming to him in his hour of deepest need, he is spinning a yarn, but he is also sharing with us the secret story that, in some deep part of his mind, he is telling himself. For the members of Roland’s ka-tet, saving Stephen King is essential. But for Stephen King, his characters call him back from the void. Their need explains his survival. Some people have guardian angels. Authors have characters. This may be a strange thing to say, but all of you out there who write know it’s true. I suppose I have always believed that reality is a subjective affair. Of course, there are always events outside ourselves that are concrete and real, and that—small as we are—we cannot change. Yet in the backs of our minds, there is a voice that takes our experience in the world and weaves a story from it, for good or dis. And I suppose that it is this doorway, the doorway of the imagination, that is the ultimate Door to Anywhere. It gives us hope when there seems to be no hope, and it allows us to enter worlds that our rationalist culture tells us are unreal. I don’t know about you, but I’m certainly glad the rationalists are wrong. And so, my fellow Constant Readers, on this note, I will leave you. During my 1,396 days living and working in Mid-World,16 I, too, have changed. But that’s the nature of both life and fiction, isn’t it? Ka turns, and the world moves on. If we’re lucky, we move on with it. Spoiler’s Warning: Read this essay only after you have read the first four books of Roland’s saga. Otherwise, you’ll get more than a glimpse of what is to come . . .
To any reader of the Dark Tower series, Roland Deschain is an instantly recognizable character. As I write this, I see him in my mind’s eye, striding across the yellowing grasses of the River Barony savannah, his black hair threaded with gray, his body tall and lanky, his holster and gun belt strapped to his hips. Only one of those fabled sandalwood-handled six-shooters is with him; it rests against his left thigh. The other is back at camp, secure in the docker’s clutch strapped to Eddie Dean’s side. As I stare, Roland turns his head and regards me pragmatically. If you need to talk to me, he says, then come. Time may be a face on the water, but in Roland’s world, water is scarce. Roland watches as I pass through the doorway of the page. His pale blue eyes really are like those of a bombardier, both cool and assessing. By necessity, this meeting will be brief. I’m another one of Roland’s secrets, and he thinks it better to keep me that way. He’s not certain what level of the Tower I come from, but he knows one thing. I am mapping his travels. Finding some shade, Roland hunkers. I hand him one of the rolling papers I’ve brought, and he accepts it silently. Unlacing the leather thongs of his traveling purse, he removes his tobacco poke and rolls a smoke. Despite the missing fingers on his right hand, he works the paper dexterously, licking the gummed side with a grimace. He strikes a match against the seam of his jeans and lights his cigarette. For a moment his face is illuminated with an eerie glow that makes his features look drawn and more than a little haggard. He has a few days’ worth of stubble on his cheeks, and his lips are chapped. Once again I try to show him this concordance, but he waves the bound manuscript away as he exhales a cloud of smoke. As always, he thinks that my constant revisions waste paper. Besides, he’s only interested in the maps. But today I’ve brought a short piece, and this he has agreed to hear. It’s my interpretation of his epic journey. Taking another deep drag, Roland rolls his hand in that gesture which means only one thing, in any world. Get on with it. So I clear my throat and (rather nervously) begin. Roland Deschain is Mid-World’s final gunslinger. Like a knight from the Arthurian legends of our world, Roland is on a quest. His “grail” is the Dark Tower, the linchpin of the time/space continuum, and his goal is to climb to its very top and question the god or demon who resides there. Roland’s world is unraveling. The Beams that maintain the proper alignment of time, space, size and dimension are breaking down and the Tower itself is foundering. This structural instability affects all worlds, but in Roland’s, the symptoms are dramatic. As the fabric of reality wears away, thinnies form and spread. These squalling mist bogs swallow all those that stumble into them, letting their captives fall into the dark no-places between worlds. As the landscape stretches, directions drift. What is west today may be southwest tomorrow and southeast the day after. A goal that lay only fifty miles away can suddenly become a hundred, or even a thousand, miles distant. As the direct descendant of Arthur Eld, King of All-World-that-was, and as Mid-World’s last dinh, Roland must rescue his land from annihilation. But his task is gargantuan. He must find a way to safeguard the framework, the loom, upon which the interpenetrating realities are woven. But to do so—in order to shore up that central Tower and the Beams which radiate out from it—he must find his way across a landscape so fragmented that neither map nor memory can help him pinpoint his destination. In fact, Roland does not even know where the Tower stands. He realizes that he must head toward a place called End-World, but where does that land lie? How can he find it? During the early stages of his journey, Roland the warrior chooses the path of the ascetic. Believing he can only reach his goal as a solitary traveler, he sacrifices all human relationships, even when it means betrayal, because he thinks such sacrifice will speed him along his way. Comrades and lovers are left behind like abandoned water skins. Roland believes that to climb the Tower he must have no ties holding him to Mid-World. He must be isolated, self-sufficient, cut off from the nurturing tides of relationship. Thinking in terms of conquest and battle, Roland follows the duplicitous Walter across the deserts of Mid-World, believing that this enemy will eventually lead him to his goal. Similarly, as a boy, he followed the path set for him by Maerlyn’s Grapefruit, a magic ball whose evil, distorting visions tricked him into first sacrificing his lover, Susan Delgado, and then murdering his own mother. What Roland doesn’t at first realize is that, like any young knight, he is being tested. The initial path he chooses is a false start, no more than a glammer thrown by the enemies who want to thwart him. What their treachery exposes is that the young Roland is driven by ambition, personal glory, and revenge as much as he is by a desire to fulfill his destiny as the last warrior of the White. By tempting him to betray all that a knight should hold sacred, Roland’s enemies ensure that Roland will repeat the mistakes of his fathers and either abandon his quest as hopeless or become lost in the deserts and golgothas of Mid-World which, in the end, but mirror the dry wreckage of his heart. Roland, the young warrior, does not understand the ultimate nature of his quest. He does not realize that, as the trickster Walter says in the golgotha, he already stands so close to the Tower that worlds turn about his head.4 Because of his own preconceptions, his inherited worldview, he does not understand that his fate, and the fate of Mid-World, are one and the same. Roland’s story is not just an adventure tale; it is one with symbolic meaning. His pilgrimage is intrinsically linked to a legend from our world, a legend which was an important influence upon the Modernists and which formed the basis for a famous poem by T. S. Eliot. That legend is the story of the Waste Land. In its incarnation in the Dark Tower series, this legend is bound to another belief, one that dates back to the time when men and women thought that their kings and queens were appointed by God. According to this worldview, the body of the king is the body of the land, and the well-being of one is indivisible from the well-being of the other. If the king is sick, in body or in mind, then the land falls to ruin. To cure the land, you must first cure the king. The one will only flourish if the other is in balance. As above, so below. The disease of the larger is the same as that of the smaller, and they both progress according to the same principle. To understand what dries and devastates the land, what threatens the very fabric of the universe and the stability of the interpenetrating worlds, one must also understand what ails the king. All are affected by the same illness, but to cure this illness we must discover its underlying cause. And this is the true purpose of Roland’s journey. We all know that as the Beams snap, the Tower falters. But what is its equivalent on the human plane? What malaise weakens the bonds of Mid-World’s culture? What disease affects Roland, the foremost representative of his fragmenting world? High Speech, the tongue of gunslingers, is a subtle and complex language. Its words are difficult to define because they are so full of nuance. Each word has multiple meanings which refer, simultaneously, to ordinary human interaction, to the web that joins the interacting individuals, and to the greater pattern of humanity’s past and future movements. No human interaction, then, is meaningless. They all reflect both individual and cultural ka. Ka, we know, resembles a wheel. In fact, it looks much like the wheel Roland draws in The Waste Lands, a wheel meant to represent the Tower, the Beams, and the Portals in and out of Mid-World. In Roland’s map, the hub of the wheel is the Tower, the spokes are the Beams, and the rivets are the Guardians, who are the Portals’ sentries. Some Guardians, like the Turtle, are protective, while others, like the Bear Guardian Shardik, are downright dangerous. But they all serve the Beams, the Beams serve the Tower, and the Tower is what keeps the universe united. And perhaps these Beams work like Batteries, with positive and negative charges, the one balancing the other. That would explain why the Turtle is kind and the Bear—the opposite end of the Beam—is negative. Even polarity has its place, like light and darkness. That is, as long as the whole remains in balance. Although it would be difficult to map the wheel of ka in this way—it is much too big—we can, at least, map the forces of ka-tet, remembering that the small is a miniature of the larger. As dinh of his ka-tet and as dinh of Mid-World, Roland sits at the center of the wheel. The Guardians of his present ka-tet are his companions Jake, Susannah, Eddie, and Oy. The sorcerer Walter—who plays a large part in the drawing and binding of this ka-tet—can also be placed as one of the Guardians, though his polarity is negative. Just as there is a word for the pattern of ka-tet, there is a word for the bonds (or Beams) that hold the tet together. This word is khef. Like almost all the words of High Speech, khef has multiple meanings, including birth and life force, but perhaps the most ubiquitous of these meanings is also the simplest. And that meaning is water. As Roland knows all too well from his journey in the Mohaine Desert, a human will die much sooner from dehydration than he will from lack of food. The same can be said about the land, about society, and about the individual soul. Once again, the patterns and forces remain the same; what changes are the superficial forms. Khef can be literal water, the essence of life, but it can also mean emotion, the essence and bond of relationship. Whether this bond is one of loyalty or hatred, it always binds. That is, as long as the forces of the positive and the negative remain in dynamic balance. A certain amount of conflict is necessary for growth and change, but too much of the negative—too much repellent—and the ka-tet ceases to exist. The patterns of ka-tet can be used to describe the subtle interactions which hold a society together. Without these emotional interactions, which create dynamic and forceful cohesion, society devolves and disintegrates; it becomes a mass of warring individuals, or warring clans. The beneficial interconnectedness of the whole is lost. The bonds of khef are reciprocal. Both parties must contribute or else the connection is at best unstable, at worst illusory. Each side must give of itself. The unity of ka-tet depends on the forces of khef. In order for the ka-tet to survive, the Guardians of ka-tet must remain true, but their loyalty depends, in turn, upon the truth and honesty of the center. When the center does not hold true, the fabric begins to unravel, and this is exactly what has happened to Roland’s world, and what has, in turn, happened over and over in Roland’s life. Ka is a wheel; its one purpose is to turn. The spin of ka always brings us back to the same place, to face and reface our mistakes and defeats until we can learn from them.5 When we learn from the past, the wheel continues to move forward, toward growth and evolution. When we don’t, the wheel spins backward, and we are given another chance. If once more we squander the opportunity, the wheel continues its rotation toward devolution, or destruction. While the High Speech terms for life and relationship have multiple meanings and subtle nuances, char, the Tongue’s word for Death, has no other meaning. Char is bleak and final. The wheel continues to turn, but we are forcefully removed from it. Since we each have a place in the greater pattern, breaking of khef rends the fabric of the All. What can be said of individuals can also be said of societies, and Roland’s society is no exception. Although Mid-World enjoyed periods of stability, its history remains predominantly a story of sacrifice and bloodshed. Although High Speech shows that unity and relationship were valued, in the everyday of life they were, more often than not, forgotten. Many of Mid-World’s sins were sins against khef, the bonding force of ka and culture. In Mid-World-that-was, the balance between positive and negative was lost; creating and maintaining khef became less important than the propagation of char. Just as the Beams began to weaken, the khef which was meant to unite began to repel. The waters of life withdrew, and Mid-World became a desert. The result? Fragmentation and dehydration on all levels of reality, and on all levels of the Tower. In “The Little Sisters of Eluria,” Roland says that the religions of his world taught that “love and murder were inextricably bound together—that in the end, God always drank blood.”6 Upon intensive scrutiny, Roland’s statement certainly seems to hold true. The Druits, the most ancient of Mid-World’s people, raised the stones of the Speaking Rings in order to have temples devoted to human sacrifice. Although these practices may have drawn some of the people together, giving them a sense of unity and strength, they would have also created a blood-debt to the victim, and the victim’s ka-tet, rending the fabric of the All. Even at this early stage of Mid-World’s cultural evolution, the negative energy released by these acts began to thin reality. The forces of char became more powerful and the forces of khef were weakened. Within these circles doorways formed, but the sentries of these lesser portals were demons, not Guardians. Although technologically advanced, the later generations of Mid-World gave little more thought to the forces of khef, or life-water, than their ancestors. The Great Old Ones created computerized wonders, such as Blaine, and accomplished amazing engineering and architectural feats, such as the building of Lud and the laying of the train lines deep below the Cyclopean Mountains, but even these seemingly “good” things were eventually tainted by the death-drive of their makers. Blaine developed a psychotic personality and drove the people of Lud on to Mid-World’s oldest practice—human sacrifice. The city of Lud, once the gem of the Imperium, fell into the hands of diseased and warring gangs, and the train lines of the mountains seethed with Slow Mutants, those terrible creatures who were once human but who had been completely mutated by the Old Ones’ poisons. No matter what grand plan they had for the future of the interpenetrating universes, the Old Ones worshiped the gods of char, the gods of destruction. The Old Ones’ technological wizardry was focused on one endpoint, and that endpoint was the creation of more and more dangerous weapons. In this they succeeded. In fact, they succeeded so completely that they wiped out their own civilization and transformed Mid-World into a poisoned, desiccated wasteland. As Susan Delgado says to Roland when they stand, horrified, by a line of resurrected war tankers, the ways of the Great Old Ones were the ways of death.7 But over the course of the series we learn that the ways of death are, and always have been, the ways of Mid-World. Even during the time of Arthur Eld, Mid-World’s greatest hero, human beings were thrown onto Charyou Tree fires to appease the gods of Reap, and in Roland’s day those old ways were not completely abandoned. As we see when Susan Delgado is made into such a scapegoat, having the blame for her town’s sins heaped upon her innocent head, such sacrifice and hypocrisy undermine all human relationships. No matter what their stated aims might be, such practices breed duplicity and mistrust and treachery, all of which are the opposite of khef. In the more central parts of Roland’s world, stuffy-guys were usually burned in lieu of men and women, but life was still harsh and leaders were bred to be killers before they were taught to be statesmen. All that the ruling gunslingers had to do to justify this sacrifice of khef was to point west to the lands that were already torn apart by anarchy and rebellion. In Gilead, the light of civilization was championed, but its ideals of fairness, justice, compassion—of fundamental human worth whatever class or land that person might come from—were left to the gentle and the lame, like Roland’s old tutor, Vannay, to promulgate. Although Roland loved Vannay, by far his most influential teacher was Cort, who taught him how to survive in a world where a knife would constantly be at his back, or at his throat. In Gilead, the sons of the aristocracy trained to be an Eye and a Hand, an aim and a trigger, before they were trained to be a heart and a mind. And often, as Roland found to his later distress, such training meant that the hand could act before the mind had time to think. Gilead’s coming-of-age battles were brutal, and the cost of defeat was banishment, a complete destruction of the khef that linked the young apprentice gunslinger to his society. The end—the creation of a strong, fearless, hardened gunslinger elite that could keep the anarchic darkness at bay—justified both the violence and the humiliation of the means. But ka makes no exceptions. As one sows, so one reaps, and the harvest is not always pleasant. Those trained killers—such as Eldred Jonas—who were banished from their society became the foot soldiers of Mid-World’s next apocalypse. The gunslingers could not see that the rot eating away at the fabric of their world was also at work upon the khef of their city, and upon the khef of their personal relationships. Roland’s father, Steven Deschain, is a prime example. Trained as he was in the ways of char, the waters of khef dried up in him, and around him. He was bound to his fellow gunslingers, his fellow human hawks, but the bond he had with his wife became arid and his relationship with his magician (who also happened to be his foremost councillor) was duplicitous. Even his relations with Roland—whom he obviously loved—were gruff and distant. The situation was no better in the castle, or the kingdom. Hax, the head cook, turned traitor, as did at least some of the guards. All bonds of loyalty were broken, there was no longer a sense of cultural ka-tet, so many turned away to serve the forces of the enemy. Farson’s propaganda about equality and democracy was only effective because it contained the grains of truth and exploited the alienation and anger of a society out of balance. In the end, the gunslingers were destroyed and their city razed, its former castle becoming the filthy nest of a band of Slow Mutants. The forces of dissolution gained their coveted ground, and the universal waters of khef drew back a little more. With the fall of Gilead, the ka-tet of the Affiliation finally collapsed, and another part of the world stretched and unraveled. As we have seen in the case of Steven Deschain, the reserved and isolated ruler who does not serve the greater ka-tet does not create the reciprocity and empathy needed to bind the parts of society into a whole. He is not behaving as a true dinh should. Although the disease predates him, and though he is, ultimately, another victim of the universal malaise, as the heir to the throne he carries the sins of both past kings and past kingdoms. As the center of cultural ka-tet, he must choose: either he must become the stable center of his kingdom and combat the malady of fragmentation or he must suffer the ultimate fate of his ancient forefathers. He can either perpetuate a cycle or pay penance, atone, and change. The disease of the land, and the disease of society, mirror the king’s ka. In order to reverse the spin of the wheel and halt the process of dissolution, the king must look into the world-mirror but see the reflection of his own face, and the faces of his fathers. When we first meet Roland in The Gunslinger, he is an anti-hero every bit as much as he is a hero. He is a man willing to sacrifice the members of his ka-tet in pursuit of his personal vision, just as his ancestors justified the drying of khef in the name of “progress” or “necessity.” Susan Delgado, Roland’s first and only true love, burns on a Charyou Tree fire because he will not be swayed from his quest long enough to save her. Jake Chambers falls into the abyss beneath the Cyclopean Mountains because Roland refuses to pause in his pursuit of the Man in Black. Even Roland’s mother dies under his guns, those symbolic weapons of his fathers. As the trickster Walter hints during Roland’s tarot reading in the golgotha, unless he, the Hanged Man, occupies the symbolic, central place of the Tower—unless he surrenders to the need of the world and focuses on the forces of khef which unite him to The Prisoner, The Lady of Shadows, The Sailor—his ka will encompass only Death, not Life. Unless he reclaims his humanity—which is, by its very definition, benevolence and respect for the needs of life—he will never reach the Tower, he will only be oppressed by its weight. Roland, the isolated individual, is a survivor, but he is no more than a fragment of a larger, lost mosaic. He has no meaning. Like the landscape he travels, his soul has become a Wasteland. As we see in both The Gunslinger and the beginning of The Drawing of the Three, every time Roland betrays khef, he finds himself in an increasingly barren landscape. After his misadventures in Tull, Roland is almost killed by the parching dryness of the Mohaine Desert. After he lets Jake fall into the abyss, he finds himself first in the golgotha, an ancient bone-strewn killing ground, and then on the purgatorial beach of the Western Sea where lobstrosities devour two of his fingers and a chunk of one of his toes. It is only when Roland draws companions to him—first Jake, then Eddie and Susannah—that the landscape becomes more hospitable. At these points Roland, the isolated warrior focused only on himself and his desires, rediscovers his humanity. Significantly, it is at these points that he actually moves closer to the fulfillment of his quest. It is no accident that Roland discovers Jake at the Way Station, the place where he finds the water he needs to survive, and that with Jake he catches up with the Man in Black. Similarly, it is only after he has drawn Eddie and Susannah into his world (and out of their own personal hells) that he escapes the lobstrosity-infested beach of the Western Sea. And it is with Eddie and Susannah that he discovers the Bear-Turtle Beam, which will eventually lead him directly to his destination. Unlike his ancestors, Roland is beginning to understand the relationship between his world and himself. He is beginning to learn from both his personal past and the past of Mid-World. Throughout the series, Eddie Dean accuses Roland of being a Tower-obsessed killing machine, but as Roland progresses on his journey, this accusation becomes less and less accurate. This Roland is determined to maintain his humanity despite the perils along his path. This Roland wants to live honorably, to live well and to live justly. And this is, in large part, what he strives to do over the course of the series. In The Gunslinger, Roland lets Jake fall into the abyss beneath the Cyclopean Mountains, but in The Waste Lands, he risks his own life to save him from the Dutch Hill Mansion Demon and then from the boy-hungry gangs of Lud. When the wheel of ka turns and brings him back to a thinny so like the one he knew as a boy in Hambry, Roland tells his new companions about his betrayal of Susan Delgado, and then about the murder of his mother. It is almost as if he needs to confess his own sins against khef before he can move beyond them. This later Roland is conscious of himself and acknowledges his past mistakes. He recognizes his potential for treachery and fights against it. He is evolving, despite the twittering, goading, vindictive voice of the Man in Black. He is evolving from a mere warrior into a king. Ka is destiny, but it is not just individual destiny. The sins Roland must expiate are not just his own, but those of all the rulers and cultures that came before him. Ka encompasses the past. Hence Roland’s pilgrimage through the wastelands is also a penance for the human sacrifice of Arthur Eld’s time, and for the time of the Speaking Rings. It is for the Great Old Ones and their hunger for power and their hubris, which drove them on to destroy the very fabric of the world. It’s for the hierarchical inflexibility of Gilead-that-was, and the violent, destructive rebellion staged by Farson’s army. It is his penance for, and his weapon against, the fragmentation generated by that gloating Prince of Chaos, the Crimson King. Khef is what unites dinh and ka-tet, what unites king and kingdom, but it is also, ultimately, the force of the Beams and the force that keeps the multiple universes spinning like sequins around the needle of the Tower. In order to save the Tower, and in order to save all of the worlds that depend upon it, Roland must preserve the waters of khef. He must reenvision the world, redefine the cultural meaning of progress, and return to his lands a sense of what is truly sacred. In order to maintain the purity and strength of khef, he must, somehow, lessen the atrocity of Mid-World’s history. If each decision—personal, national, global—has a thousand different possible outcomes, each of those outcomes presents another possible future. Each of those futures will be different, and each will spin a unique timeline which exists only in that newborn world. But each of those future worlds remain linked, though they have no awareness of each other. Their link is the seed-moment that they came from, a seed held in the Eternal which encompasses every moment that ever has been or ever will be. They are all linked by the Tower. In order to save the Tower, in order to ensure that there is a future for all these worlds and to ensure that more and more worlds are born, Roland must journey into the mythic history of his world—he must journey into our world. His quest, in the books to come, will be to save not a king or a kingdom but a single rose. A rose which sits in a vacant lot of a city which will someday become the technological Oz of the Great Old Ones, the foundation of their pride and the seed of their Fall. Before Roland, the great Warrior of the White, can save the Tower, he will have to risk his life to save a delicate flower whose yellow center is the womb of all worlds, and whose voice is the voice of Yes and of Always. He must save a simple rose which is, in our world, the symbol of unity and the symbol of love. In their very imagery, the Tower and the Rose unite the symbolic male and the symbolic female, the two parts that join to give birth to the universe, and to life. In this unity they become One, which is simultaneously the center of all existence and the center of the integrated self. These two polarities, which seem so separate, bring together aggressive adventuring and passive nurturing, that within us which strives to conquer, to hold fast to high ideals, and that which is flexible enough to allow for human foibles, in ourselves and in others. They unite us with ourselves, our personal pasts, but also with the greater world. Although the Tower may reach higher than the heavens, and though the Rose may sing a single aria that rises from the deepest well of the universe, both are—as Roland sees and hears in his visions and his dreams—woven of many voices and faces. The Tower and Rose unite to form the self’s axis, but they also function as a brutally honest mirror, exposing where we have betrayed both ourselves and the world. The two, which are One, contain the voices and faces of Roland’s betrayed loves, the reminders of his sins against khef. And it is these, in the final reckoning, that Roland will have to face. Roland journeys through the purgatorial wastelands of his world as both sinner and redeemer. He is simultaneously the king, the land, and the Everyman. Through the course of his journey he must come to Know Himself. And only in this way can he begin to approach the Tower.